The importance of place in our lives is hard to overestimate. We all have moments of realization where we admit to ourselves how grateful we are to have avoided being born somewhere else in far worse circumstances. Yet, there are always those more subtle factors that appear as time passes. How else can one explain my fondness for Funky Poodle, a song you will likely never forgive me for mentioning? You had to be a certain age in Northeast Ohio even to have that on your radar (as well as the self-awareness to admit that perhaps those brain cells dedicated to that memory would have been better used for Calculus I). Any visit to an art museum will demonstrate the influence of location on the landscape painters. It’s there on the canvas. Here, I am more interested in the art that they had the opportunity to see before they ever picked up a brush as well as their surroundings as they started their life’s work. For a century or so, we have had music and drama and all the other arts available to us in a profusion unimagined by previous generations. To tell the truth, we have not always been in control of that waterfall. In my case, I listened to a lot of rock and roll and other pop music from the major labels as well as local acts who started breaking through to greater popularity. the Raspberries, the James Gang, and others emerged from Northeast Ohio, so we were on the national music map. 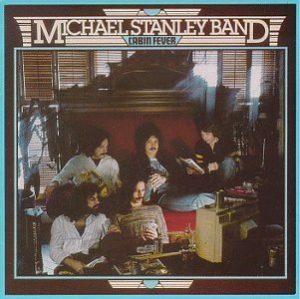 Michael Stanley Band hit at the perfect time for me to notice their album Cabin Fever. Before Devo, Pere Ubu, and the Pretenders could teach me to expand my horizons, the Michael Stanley Band had this perfect gem of an album that taught me what rock and roll should sound like. Which is my point- all artists start out as young children… Somewhere in those early years, the base lines are set for what certain things are. While that certainly applies to consumers, we lose sight sometimes of what that means to artists. That base line becomes either something you cherish, you rebel against, or you build upon. Maybe the truth is that we go through all three stages. Somewhere along the way in my youth, I wondered about those middle of the road tastes of mine and wondered if I could make my peace with those early favorites. Of course you can. It is possible to love this and this. So, how do you build on your early influences and create new art? That has always been the question, hasn’t it? We are responsible for knowing our history and recognizing the good and the bad. I can’t build a plot or craft a structured work without acknowledging the many who did it first (and better). Of course, sometimes you want to go back to your younger self and slap him for wasting time listening to certain things. You’ve Got to Check This Out is a blog series about music, words, and all sorts of artistic matters. It started with an explanation. 233 more to go. New additions to You’ve Got to Check This Out release regularly. Also, free humor, short works, and poetry post irregularly. Notifications are posted on Facebook which you can receive by friending or following Craig.